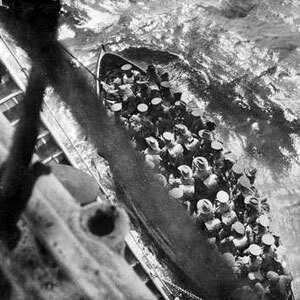 April 25, 1915: A boatload of 6th Battalion soldiers leaving the transport ship HMT Galeka on way to land at Anzac Cove. A simple post today to mark ANZAC Day, a day for paying tribute to the men and women from Australia and New Zealand who served in World War One. These days, many of us take the opportunity to use ANZAC Day to reflect deeply upon all of us who are, who have and who will be affected by war directly and indirectly. But when it comes to issues and problems so ingrained in human psyche, like our despairing inclination towards war which clings to humandkind like the stain of blood on Lady MacBeth’s hand, I believe that music, poetry and art seem to be more effective than words in accessing a heightened sense of perspective and insight. But first, the ode from Laurence Binyon’s poem, For the fallen, that will be read at every ANZAC Day commemoration today. It is timeless and poignant. And the Band Played Waltzing Matilda would surely be one of the greatest anti war songs ever written. In it, Eric Bogle explores the topic deeply, acknowledging the courage and terror of war, and yet connecting deeply with our humanity. When I worked at 5MU in Murray Bridge in the 1980s and 1990s, I had the great pleasure of interviewing Eric Bogle and talking about the original version of this song which runs some 14 and a half minutes. I was able to play it on my show because I was also the music director at that time but Eric lamented that radio programmers and even some concert goers did not have attention spans equipped to stay focussed that long. It is a great pity because the full version is even more heart rending than this version, below. If your eyes are dry, you didn’t really listen! Bring Him Home is one of the most powerful songs in Les Miserables. The reason this always comes to mind on ANZAC Day for me is again due to an interview I was fortunate to have with Normie Rowe back in my 5MU days. Normie is not only a legendary singer he is also a Vietnam Veteran he dedicated Bring Him Home to his fellow Vietnam Veterans who did not receive the heroes welcome that other serving soldiers received from all previous wars. When listened to in that context, it makes this beautiful song even more powerful. It is impossible for me to think about war without hearing Bob Dylan’s Masters Of War echoing in the background. This is a blunt, bitter, damning song pointing a cursed finger firmly at all those who instigate and propogate war, typically at the expense of others. It is the underlying anger of the ‘sent’ towards the ‘one who sends’ that gives this song its extra kick and rakes the coals of intolerance towards warmongers. Unfortunately, there is no suitable version on YouTube by Bob Dylan himself, but this version, by The ROJ LIGHT is a superb rendition, with an opening scene by Martin Luther King – a great touch. Thank you for a very meaningful tribute today.